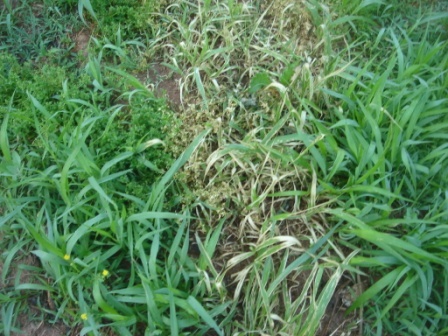 The ever popular Round Up weed killer is toxic to humans and the environment. Here is a cheap and effective way to kill unwanted weeds and grass without the harsh chemicals. The picture is one day after I sprayed the formula in a strip. The dying vegetation was the same as the right and left. 1 teaspoonful of dish washing detergent. If you use this in your garden you could substitute Himalayan Salt to add trace minerals to the dirt. I made your weed killer formula and sprayed it on weeds and some unwanted grass. Unfortunately it didn't really kill anything. It turned them a little white, but then they came right back. How much should I spray (or should I POUR it on?) and how often? THANKS!